Baby Rhino Hawk at Baby Rhino Rescue | Adopt and Donate Now! Hawk arrived at Care for Wild Africa in October 2014. His mother was poached in the Kruger National Park. He was over a year old and in good condition when he arrived. 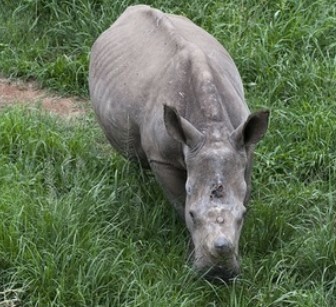 Hawk is a feisty and clever young rhino and incredibly brave. When he first arrived, the handlers tried to herd him into another boma, but he would not move; so they used a motor vehicle to try and coerce him, whereupon he charged the vehicle! He will stand his ground and fight. In the first few days, one of the handlers made the mistake of not securing his night pen well enough and Hawk managed to get out. He went on a long journey into the adjacent game reserve and it took an entire team all day to get him off the mountain and back into the safety of the enclosure! Hawk now shares a night enclosure with Timbi, Forrest and Olive. He is full of energy and likes to tussle and play. The rhinos have access to the large outdoor area all day, so Hawk is getting to know Storm and Lunar also. The first time he was introduced to the larger rhinos, he went straight up to them with no fear or hostility. Even though he is substantially smaller than Storm, he will take the older rhino on, mock-charging him and wrestling with him. Hawk has become very accustomed to his new home. He loves the freedom he has all day, grazing with the others in the lovely outdoors. When he is hot, there is a mud bath and the shade of massive acacia trees.